Darrow is the Reaper of Mars. Born to toil, carved to fight, destined to lead. But he is a broken man. Exposed as a Red in a world ruled by Golds, he has been captured and tormented until he is something less than human. And yet, he is humanity’s last chance. In facing a godlike, ruthless enemy, he must call on every last ounce of strength to prove that loyalty, friendship and love are more powerful than any coldhearted machine of war. He has been first Red, then Gold. Now he must transcend them all. He must become the hero his people believe he is. 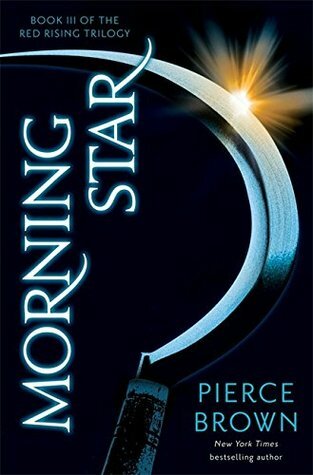 Morning Star is a brilliant finale to the Red Rising Trilogy. Written in first person present tense, I found it easy to wear Darrow’s skin and think his thoughts. As a main character, Darrow knows he is flawed. His endless faith in the people he loves and trusts has led to some big mistakes, and he tries to learn from them here. Morning Star has a long list of characters (as do the previous two book) which adds to the depth of world building. I loved rediscovering all my favourites – Sevro, Mustang, Cassius, Roque, and Victra. Sevro still made me laugh, but I felt less inclined to love him in this book, although there were a few moments where he almost redeemed himself. The death of one character broke my heart (I won’t spoil it). The differences in the each of the colours – there are more than just Red and Gold and they all serve the Golds in one form or another – is an interesting aspect of the world building. One of Red Rising’s strongest draw-cards is that the plot lines always keep you guessing and the political intrigue is as fun to read as the action. And there is plenty of action from start to finish in Morning Star; Darrow and his friends travel throughout the solar system, making allies and fighting the enemy, both on-world and off. A hopeful and open ending rounded off the series perfectly. I have followed Darrow’s journey from Red to Gold, to broken and back and loved every second of it. If you are a science fiction fan and want to read something a little different, and you haven’t yet read Red Rising, then what are you waiting for? Go and get all three books of the Red Rising Trilogy now.